The first Irish-made satellite could be orbiting the planet in early 2019 and may even have a small tricolor on board, this according to an article in thejournal.ie. Eirsat-1 will be small and will be completely Irish-built with an orbit lifetime up to two years in length. The project is being led by the UCD Space Science Group along with students from Queen’s University Belfast, with the backing of the Irish Research Council. The program is being funded by the European Space Agency (ESA) and five Irish companies are involved in various technologies on board. 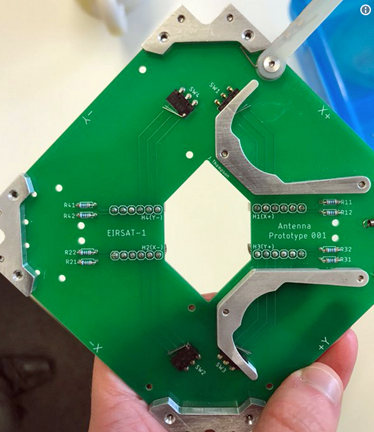 No prototypes have yet been built and the satellite components will have to be made before Eirsat is assembled late next year, but the plans are at an advanced stage. When finished, the satellite will launched to the International Space Station (ISS) where it will then be released into space. Ph.D. student Lána Salmon from UCD’s School of Space Science and Technology is working on the project and explains that the small size of the satellite offers both challenges and advantages for the build team. The advantage of having the satellite so small is that it can go on to rockets quite easily. She noted that the ISS has a NanoRack Deployer, which is basically like a robotic arm, "and they put the smallsat into a chamber and it gets picked up by the robotic arm and basically chucked out into space, for want of a better word." The ground team at UCD will have some measure of control over the satellite to adjust its orbit and make certain the spacecraft is facing the sun. There are no rockets on the satellite, but it can adjust its position using a small magnetic coil that can create a magnetic field that reacts with the magnetic field of the sun.